If you don’t like musicals, stop reading now. Because while I think this is truly a great film adaptation of a stage musical, if you don’t like musicals, you really won’t like the dancing fight scenes. Based on Shakespeare’s Romeo and Juliet but set in inner-city New York in the fifties, West Side Story follows the love that grows between Maria and Tony. It has some of my favourite ever musical songs (I want to live in America is one of my all time favs) but far too many ballads for my liking. Even though it is a great film, it’s not without its flaws. Like Natalie Wood’s appalling accent, or the fact that it goes forever. But it is still magnificent. And don’t blink – there’s a uncredited appearance by John Astin in there too! 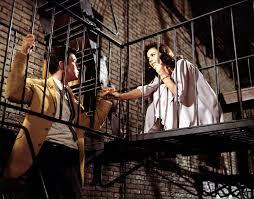 West Side Story won awards for Best Picture, Best Actor in a Supporting Role (George Chakiris), Best Actress in a Supporting Role (Rita Moreno), Best Director (Robert Wise & Jerome Robbins), Best Cinematography, Color, Best Art Direction – Set Decoration, Color, Best Costume Design, Color, Best Sound, Best Film Editing and Best Music, Scoring of a Musical Picture and was nominated for Best Writing, Screenplay Based on Material from Another Medium.